I went through a phase in college where I absolutely could not eat eggs. I could barely look at them. And then I was out with my girls in Philly a few years ago and saw deviled eggs on the menu. Deviled eggs? That is something I have seen in the deep south or on an appetizer menu circa 1970. But it sounded good and we ordered it. I’ve never skipped ordering deviled eggs ever since. They are making a very trendy appearance on the food scene and you can find them just about anywhere. Out went traditional flavors and in came wasabi eggs with an Asian influence; bacon and bleu cheese eggs for some serious comfort food. 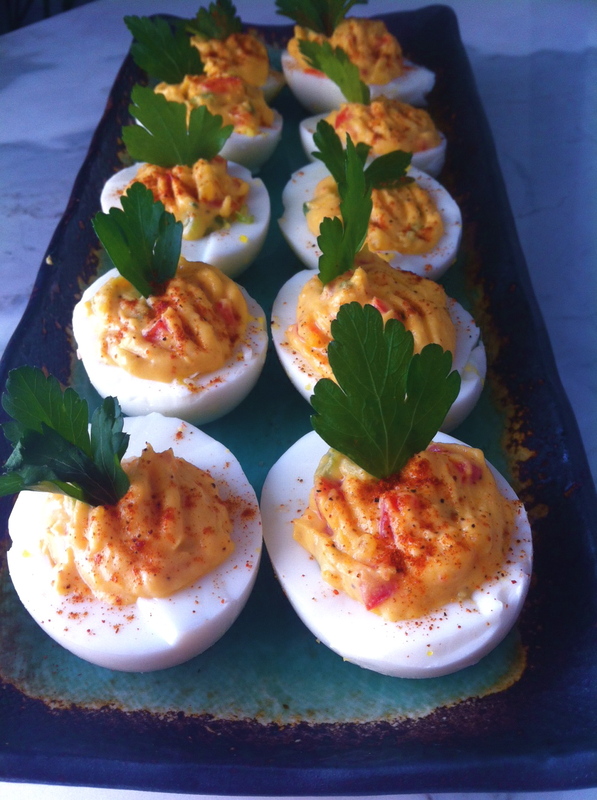 In honor of my New Orleans Super Bowl menu, I have made traditional deviled eggs with a Creole twist. What is Creole cuisine? Creole foods are found mostly in New Orleans and other parts of the south. Foods are heavily spiced and the flavors are influenced by a number of world cuisines, Africa, France, and Spain being among them. One bite of anything from Creole cuisine and your taste buds will ignite. My favorite Chef in culinary school always told us that appetizers should have certain qualities. They should be bite-sized; no one wants to make a mess of themselves to start their evening. They should be very flavorful- a preview of what’s to come. You don’t want to start on a bland note. Last, but more important, they should be hot enough (with temperature) or hot enough (with spice) so that people want to drink. It lightens the mood and makes people social. Exactly the vibe I’m looking for to start a Super Bowl party. These deviled eggs have a kick. They have some crunch from fresh bell pepper but some true spice from cayenne pepper and jalapeno. If you want to tame the fire, half or omit the jalapeno. Doesn’t matter how hot you make them, these babies are a crowd favorite. Put the eggs into a sauce pot and cover with water. Add the apple cider vinegar to the pot. Bring the water to a boil, cover the pot with a lid, and turn off the heat. Let the eggs sit, covered, for 15 minutes. Drain the water from the eggs and rinse with cold water until they are cool enough to touch. Peel the eggs. Something always goes wrong with an egg and it peels funny. This is why I make the extra. Cut the eggs in half lengthwise and remove the yolks. Reserve 4 yolks for the filling, discard the rest. This cuts down on the fat content. Mix the yolks with the remaining ingredients except for parsley. Mix well so that everything is combined and smooth. Season to taste with salt and pepper. Use a piping bag to pipe the filling back into the egg halves. Fill just over the top so they look plump and full. Garnish with parsley leaves. Refrigerate until ready to serve; serve at room temperature.